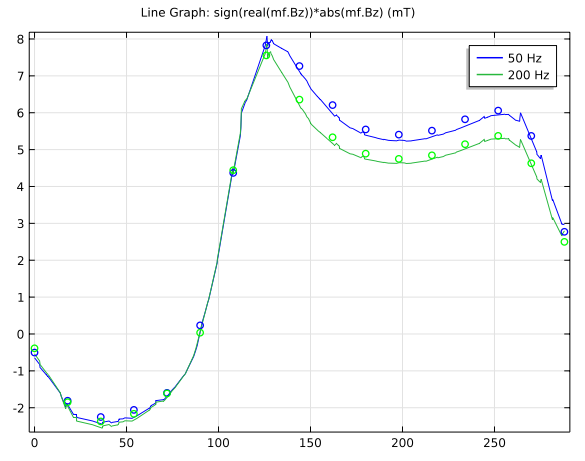 Have you been looking for software that can solve the Testing Electromagnetic Analysis Methods (TEAM) Problem 7? We solved the problem with COMSOL Multiphysics and the AC/DC Module. Here are the results. The Testing Electromagnetic Analysis Methods (TEAM) group formed with the goal of comparing different computer codes for electromagnetic analysis. To do so, the TEAM group meets periodically to come up with benchmark problems. 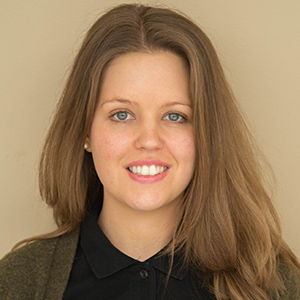 Each set also contains experimental results for validation. One of these problem sets, Problem 7, pertains to an asymmetrical conductor with a hole. The scenario involves an aluminum conductor that is arranged asymmetrically over a multi-turn coil, which carries a sinusoidally varying current. This arrangement induces eddy currents and a magnetic field — both of which can be calculated. Problem 7 requires the solver to compute these fields and currents at different positions. 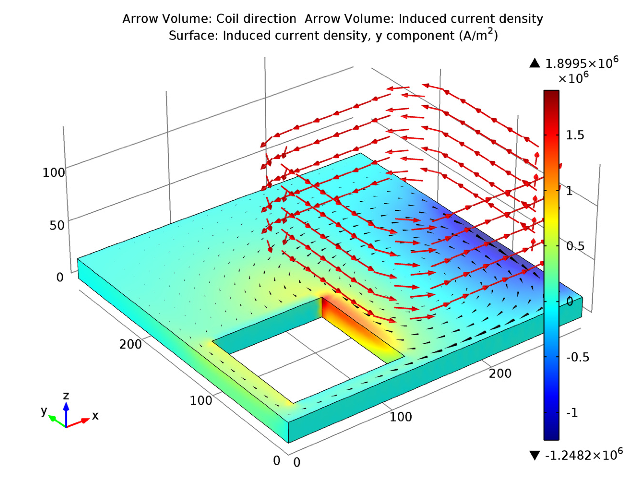 We have created a model to show you how to solve this benchmark problem with COMSOL Multiphysics and the AC/DC Module. To solve Problem 7, we need to compute the eddy currents and magnetic field in the conductor for coil current frequencies of 50 and 200 Hz. If our results at the specified positions match the experimental data, we can draw conclusions about the accuracy of COMSOL Multiphysics. Problem 7: The geometry of the multi-turn coil (2,742 turns) placed asymmetrically over the conductor plate with a hole. The sinusoidally varying current in the coil is 1 A/turn. 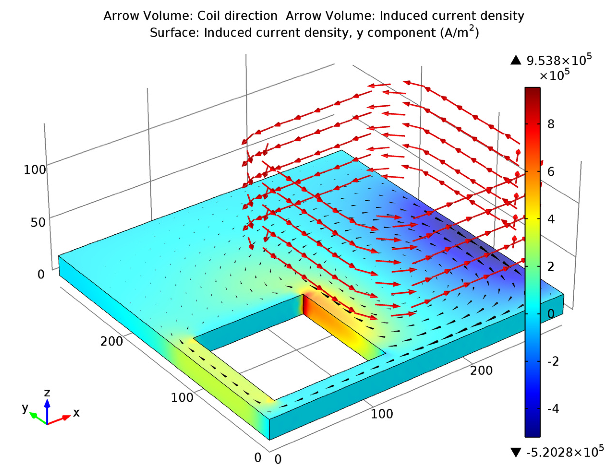 Using COMSOL Multiphysics and the AC/DC Module, we can simulate our results at the two frequencies. 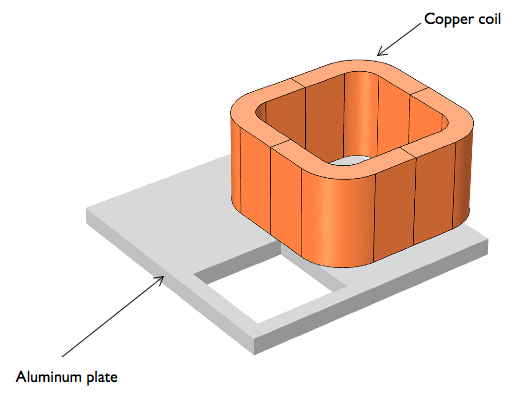 Below, you can see two 3D surface plots of the y-component of the induced current density in the plate. Arrows denote the direction of both the coil current (red) and the conductor’s induced current density (black). To illustrate how the results compare, we have plotted our simulation (solid) and the experimental results (circles) in two line graphs. The left-hand graph shows the values for the magnetic flux density, while the right-hand graph depicts the induced current densities. Comparison of results: z-components of the flux density. Comparison of results: y-components of the induced current densities. 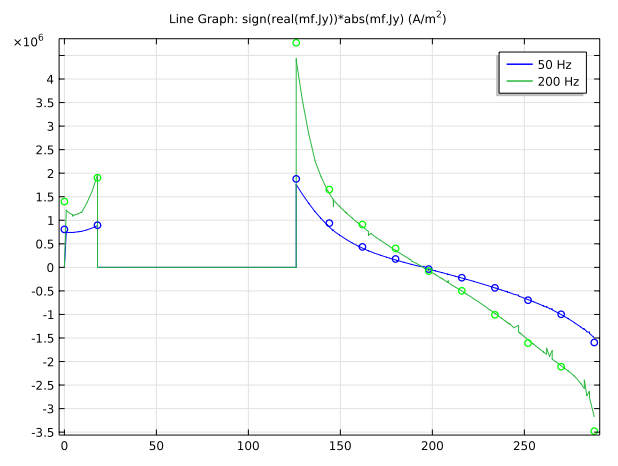 As we can see, our simulation results agree very well with the experimental results. We have solved Problem 7 according to the TEAM specifications.